The new Pocklington Cricket Club clubhouse is opened by Judy Culley, the partner of a recently deceased stalwart member of the club. 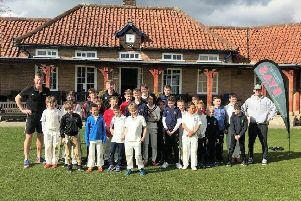 The new clubhouse at Pocklington Cricket Club has officially opened after funding received from various sources, including commuted sums provided via East Riding of Yorkshire Council. The new clubhouse has a large bar, well equipped kitchen, two large screen TVs, a full range of toilets including disabled and baby changing facilities, and can accommodate up to 120 people for functions. Steve Relph, committee member at the cricket club, said : “Pocklington CC is indebted for all the help, support and funding provided by East Riding of Yorkshire Council (£150,000 through Commuted Sums); Sport England (£50,000) and WREN (£42,000), as well as donations from other sponsors and fundraising events by the members. “It has taken much hard work by many volunteers at the club, and from the local community, but the end result is well worth it.